Owned by Chris Camarda the Andrew Will winery was founded in 1989 and named after his son Will, and nephew Andrew. This premium producer has really put Washington on the map for creating boutique, highly distinctive wines. The winery began humbly in a rented Seattle warehouse with all operation carried out manually; and today the winery is located at an impressive 5-acre site on Vashon Island. The premier vineyard sites consist of plots in the Columbia Valley; Champoux Vineyard in the Horse Heaven Hills AVA of which Andrew Will is part owner, Ciel du Cheval on Red Mountain, and Chris Camarda?s own vineyard Two Blondes in Yakima Valley.The vineyards are farmed sustainably and low precipitation and humidity help minimize mildew and disease. Ample sunlight of 17.4 hours per day (two hours more than Napa) is another factor that contributes to make this area phenomenal for viticulture. "Camarda's (wines) blend power with elegance, concentration with finesse, and super sweet fruit with definition. (He) is a brilliant winemaker." -Robert Parker. As Chris Camarda has developed his style of winemaking over the years, he has focused on the primacy of the vineyard over variety. It is now the driving force behind Andrew Will. While the idea of terroir has become almost a hollow marketing tool, it has great attraction for Chris in its purest form. "I believe that an individual piece of property can form a signature - an identity - and it is that face that is the focus of my winemaking, " he said. "We are trying to let the vineyards reveal themselves. 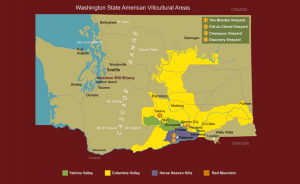 I believe that if Washington is ever to be considered a great wine region we need to establish the characteristics of our geographical areas and the characteristics of each vineyard in those areas," he added.